Volunteering and community service is a way of life for current Foundation Vice President Mr. Bob Barton. 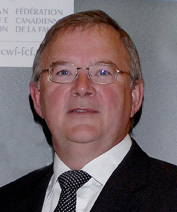 Mr. Barton has held numerous roles on the Canadian Wildlife Federation Board and served as its President from 2003-2005. He was also a Founding Director and Chair of the Manitoba Habitat Foundation, a life-long member and Past President of the Manitoba Wildlife Federation, a past member of the Manitoba Roundtable on the Environment and the Economy, and a Director and Past Chair of Wildlife Habitat Canada. A retired teacher and avid outdoorsmen Mr. Barton was born and raised in Manitoba. He currently resides in Carberry, Manitoba with his wife Mary. Bob and Mary’s son Grady and his wife Laurel, both veterinarians, live in Alberta with their children Russell and Quinn. Their daughter Lindsay, a registered nurse, lives and works in Vancouver. Bob and Mary enjoy most of their summer living off the grid at their island cottage on Lac du Bonnet, a part of the Winnipeg River system in Manitoba. Bob also spends part of his winter vacation volunteering with several charitable organizations on construction projects in Mexico.